As a first-generation student, Neila Smith came to NKU as a biology major from Belize. When she returned for the current spring semester, she struggled to find funds to pay off her $2,800 balance. As February approached, she packed her bags and left, unable to remove the balance from her account. Recently, the sophomore switched to a public relations major, one she felt suited her better. Though she had to leave, she plans to save up funds and return. “Coming from an immigrant family, it’s more of a ‘Come to America, come to college. Get a nice job, make money and help out the family.’ It’s definitely disappointing that I even had to take a semester off just at home,” she said, adding that she already had an established group of friends. As an immigrant, she moved roughly every four years. For her, NKU was a place she felt established; for once, she felt like she was at a place that held more permanence. When she realized that she still had to pay off a balance in order to continue being enrolled as an NKU student, she said she was told to go to the financial aid office, who then suggested filling out paperwork for a parent-plus loan (a loan offered to parents of students enrolled at least half-time, or graduate and professional students). It was a week-and-a-half process before she finished. Her dad lives in Texas and her mom lives two hours away. For any paperwork they had to sign, she faxed it over or did it digitally. Then, she found out she didn’t qualify. It was too late for Smith to figure anything else out. She stopped by four different departments that week in search of scholarships, but deadlines had already passed. She felt that if she had realized this earlier, that she may have been able to stay. “I wish the system in terms of financial aid was more supportive of students because a lot of people in financial aid—I realize that they can only do so much—but some of them don’t even care to go the extra mile for the students,” she said. She also said that she had gone to the financial assistance in a prior semester and they were able to help her take out a loan, particularly Leah Stewart, assistant vice president of enrollment management. In the past few years, NKU’s retention rates have risen. Though there are students like Smith who are unable to return, the Office of Enrollment Management wants to lessen the amount of students who face similar situations. 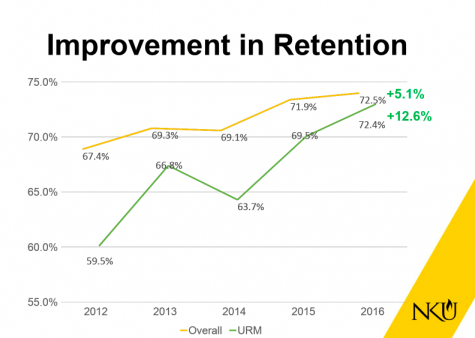 Since 2012, retention rates have risen from 67.4 percent to 72.5 percent in 2016. For underrepresented minorities, rates rose from 59.4 percent to 72.4 percent in that same time frame. According to Stewart, an estimated 80 percent of the university’s students rely on or are recipients of financial aid, which includes merit-based need, federal or state aid or outside sources (such as scholarships). For students and families to maximize their aid eligibility, the office of financial assistance first encourages them to complete a free application for federal student aid so that they can be considered eligible for federal and state aid programs. The Office of Financial Assistance isn’t the only section of campus working to retain students, according to Assistant Vice President for Student Success and Assessment Ryan Padgett. The process takes a patchwork of departments working together. Their work is data-driven and invests in programs, he adds. They look for ways to support students that Kim Scranage, the vice president of enrollment management, says reflect NKU’s student body. Scranage said that they work to try an approach that will impact or provide an avenue for students across the board to reach out, find help and eventually walk across the stage at graduation. Over the past few years, Scranage said the office has worked on a number of initiatives to make NKU affordable. In terms of academic scholarship based on GPA, students would have to obtain a certain amount of hours between fall and spring. Now, students can attend classes through the summer to keep their scholarship. Programs like University Connect and Persist are in place for students to meet with staff to navigate financial, personal and academic topics. Under UCAP is a lending book library, which Padgett said more students are both using and donating to. They also partner with SGA to set aside a pot of funds for a retention award (a one-time only tuition assistance award for students who meet the criteria). The 15 to Finish program encourages students to take 15 credit hours each school year in order to reach 120 credit hours and graduate on time. He added that they’ve also implemented Project Graduate, which focuses on students who left the university on 3-6 credit hours short of the degree. They help re-enroll with financial support in order to obtain their degree. There are a number of ways Stewart says they reach out to students. They reach out again and encourage students to take advantage of winter courses. Then, again, they reach out before the spring semester to make sure students know to register for ‘X’ amount of hours in order to meet their criteria. Midterm season means another reminder, and then another once grades post. “Not everyone is going to come to us, so we have to out as well,” Scranage said, adding that they set themselves up in the Student Union, go into classrooms, have workshops, hit multiple social media spheres and make themselves available via appointments or through email. The university has a number of approaches to reach students. Students come in with different factors stacked. 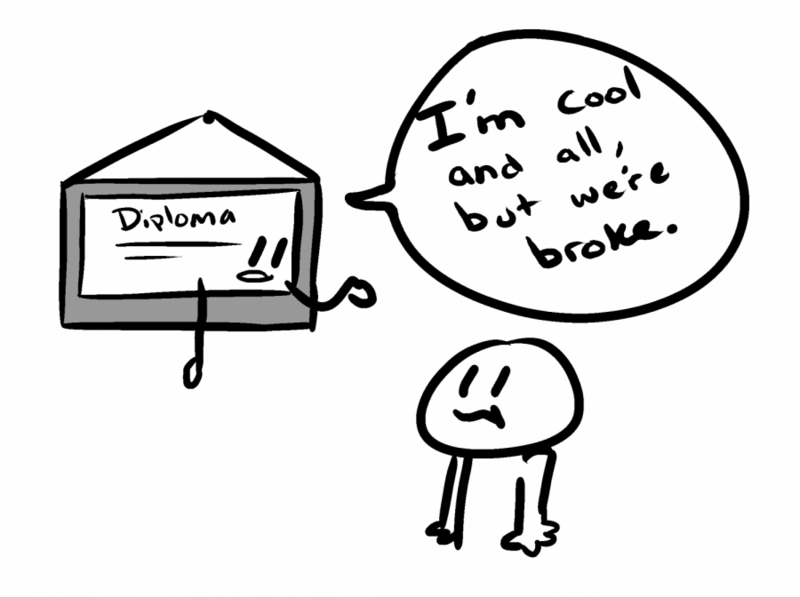 Maybe they owe another institution money, or they come in with varying levels of financial literacy. A number of factors led to Smith leaving. After her friend died by suicide last November, she struggled to keep up with school. In her first semester, she received a retroactive late withdrawal from her classes. Smith hopes to return in the fall despite the struggle she’s had over finances, saying that she wouldn’t want to re-adjust to a new campus with new people. NKU is still home. Scranage said that students don’t always let on why they aren’t returning, but there are usually a number of factors present. 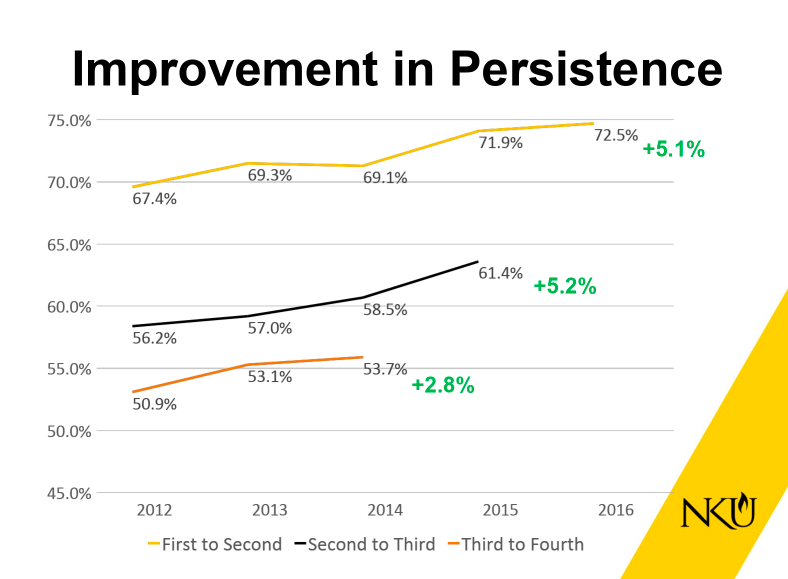 Along with retention rates, rates of persistence (students staying from one year to the next) have also risen to the highest they have ever been. 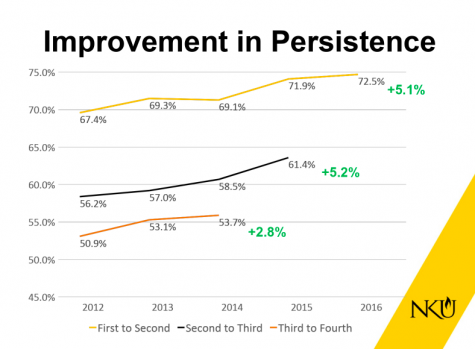 Rates of ‘Persistence’ have risen as well, which means more students are continuing their education at NKU from one year to the next. If students are just short of covering their balance, the OFA and enrollment management has set up ways to fund closing those smaller gaps. These micro-scholarships are funneled through the academic colleges. Micro-grants are offered by the OFA. Since starting it two summers ago, they have awarded between 160,000 and 180,000 micro-grants and scholarships. This semester, the College of Informatics started a campaign to garner gap funding for their own students, with the goal of raising $10,000. The campaign ended on March 22 and raised just above $8,000. COI was contacted by degree enrollment on implementing a campaign called ‘Assist to Persist’, he said. This year, it was more organized and pointed than in the past. Students might be referred to the OFA through their advisors if they have a hold on their account. If they aren’t able to pay that small gap, the funding from this campaign may be able to help them, though assistance from this fund is limited to a max of $1,500 per student. There is no specific GPA needed–just students who are nearly there and working hard. “There are people who are doing everything they can do to pay, and they’re still coming up short,” he said. That’s the impact this fundraising effort could have on COI’s students: the ability to continue their education. The campaign reached out both directly (through advisors), and through various social media channels. Most of the donations, Yungbluth thinks, have come from alumni who remember the financial struggle of going through college. He can’t deny that college is expensive, but Yungbluth said they’re working to figure it out. In the end, both COI and the Office of Enrollment management said they want to take care of their students, and this is just one way to work toward that goal.